A Brick Dolly is designed to help brick layers working in residential or commercial construction projects move brick and blocks into areas where forklift access is either restricted or unworkable. Avnix sees the best application of these brick carts in single floor building projects where forklifts are simply too costly to buy or rent, and where the construction area itself is considerably smaller than that around larger residential homes. Brick dolly’s are amazingly capable tools for this chore, and they are reasonably priced for even the smallest of construction business to invest in. The brick cart are a great deal safer and more ergonomic to use than a standard brick wheel barrow and allows you to move brick and materials quickly. The motive for this is very straightforward. Bricks and blocks are pre-stacked and banded previous to shipping and delivery. In order to transport them in a wheel barrow, you have to cut the bands, stack the bricks in the barrow, and then hand stack them again after you have unloaded them. This is a waste of time and money that slows down project finishing point. Brick dolly’s and block carts, on the other hand, facilitate you to transport entire stacks of banded brick and blocks without having to cut the bands. All you have to do is run the forks into the bricks (or blocks) and tilt the brick dolly back. This allows you to pick up as many as two bands of brick at a time and easily transport them to the construction area. It is not required to hand stack or unstack the bricks, so an huge amount of time can be saved. Additionally, it is much easier on your workers back because you do not have to bend down to load and unload bricks like you do when using a wheel barrow. Brick layer workers basically wheel the brick dolly or block cart to the construction area and stand it up in a upright position with the bricks still held in place by the forks. Employee then cut the bindings at the top and use from the stack how many bricks they needs. For scaffold work, brick and block carts can be positioned right under the scaffold, and bricks can hand stacked on the scaffold as needed. 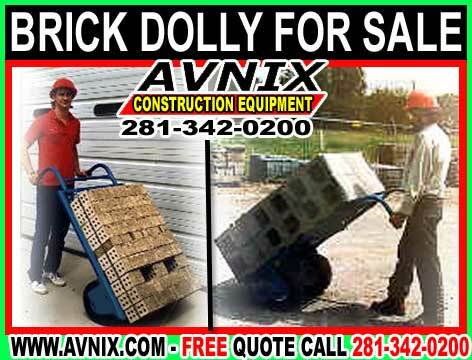 Avnix sells brick dolly’s and block carts in two different models: the Rough Terrain Brick Cart and the Deluxe Rough Terrain Block/Brick cart. Both feature 8” forks and a heavy duty 1” axle. Each measures 29” in width and rolls easily over any terrain on 4 ply high-float tires. The Rough Terrain model can handle a tilt capacity of 600 pounds, and the Double Back Plate model features an additional pair of 15” forks specifically designed to handle any block package. Using a handy, ergonomic device such as the Avnix brick dolly and block cart facilitates rapid mobility, safe employees and project completion deadline met on time. Truth be told, many businesses who invest in brick dolly’s and block carts, as well as other space reduction and ergonomic tools, can in fact lower their equipment costs adequately and win more bids by passing their material handling savings on to the general contractor. MODEL AV-203 Block Or Brick Cart – Tilt Cap. – 1,000 lbs. ` Accommodates any banded block or brick package ` Larger Back Plate with more fork adjustment holes ` 4 ply – wide high-float tires ` Heavy Duty 1″ dia. axle with 3″ roller bearings ` Spring loaded positioning wheels ` Overall width 29″ ` Weight 140 lbs. Deluxe Rough Terrain Brick & Block Cart M.
MODEL AV-202 Brick Dolly – ` Tilt Cap. – 600 lbs. ` Accommodates any banded brick package ` 4 ply – wide high-float tires ` Heavy Duty 1″ dia. axle w/ 3″ roller bearings ` Overall width 29″ ` Weight 115 lbs.